How nice is that recommendation and testimonial ! We aim to please. Not just with our Resin driveway service but with our business attitude in general. I read somewhere many years ago a saying “you are only as good as your worst workman. What more can I say! This Nottinghamshire resin driveway recommendation is presented on our website as a credit to our hardworking staff. In this current business climate we are all competing hard for business. With the marvels of the internet this has enabled us to complete driveway, paths and patios within the Derbyshire, Nottinghamshire, Sherffield, Chesterfield, Newark and Derby areas (just to name some). Concrete, tarmac, imprinted concrete and slabs are all existing surfaces that we can work with. Perhaps you would like to incorporate you resin driveway path or patio into your garden design. 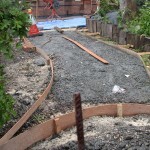 This is a Mansfield resin path and garden project and you can see where we are incorporating a curve detail. Call us now and let us improve your garden and driveway. A weed free and anti slip surface which can enhance your garden. Patios are prone to deterioration over a period of time, this is where our resin can transform your outdoor space. In this current climate the moisture and damp is a breeding ground for weeds. Only today June 13th have I seen the ever chanaging weather – sunshine and showers – hail being a part of it. With our impermeable surface, if water cannot get down weeds cannot get up. No backbreaking weeding. This entry was posted on Thursday, June 13th, 2013 at 6:36 pm	and is filed under Chesterfield, Concrete, Derbyshire, Diary of a Mansfield Resin Driveway Company, Driveways, gardens, Imprinted Concrete, Latest News, Mansfield, Nottinghamshire, Paths, Patios, slabs, Tarmac and Asphalt, Testimonials, weather. You can follow any responses to this entry through the RSS 2.0 feed. Both comments and pings are currently closed.